During the reign of the seventh-century king, Songtsen Gampo, Tibet was one of the mightiest empires in Central Asia. Tibet, then, had an army of 2,860,000 men. Each regiment of the army had its own banner. The banner of Ya-ru To regiment had a pair of snow lions facing each other, that of Ya-ru Ma a snow lion standing upright, springing upwards towards the sky, and that of U-ru To a white flame against a red background. This tradition continued until the Thirteenth Dalai Lama designed a new banner and issued a proclamation for its adoption by all the military establishments. 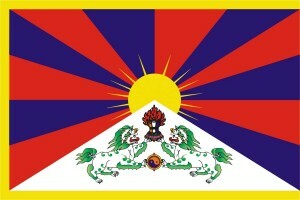 This banner became the present Tibetan national flag. In the centre stands a magnificent snow-clad mountain, which represents the great nation of Tibet, widely known as the Land Surrounded by Snow Mountains. The Six red bands spread across the dark blue sky represent the original ancestors of the Tibetan people: the six tribes called Se, Mu, Dong, Tong, Dru, and Ra which in turn gave rise to the (twelve) descendants. The combination of six red bands (for the tribes) and six dark blue bands (for the sky) represents the unceasing enactment of the virtuous deeds of protection of the spiritual teachings and secular life by the black and red guardian protector deities with which Tibet has been connected since times immemorial. At the top of the snowy mountain, the sun with its rays shinning brilliantly in all directions represents the equal enjoyment of freedom, spiritual and material happiness and prosperity by all beings in the land of Tibet. On the slopes of the mountain a pair of snow lions stand proudly, blazing with the manes of fearlessness, which represent the country’s victorious accomplishment of a unified spiritual and secular life. The beautiful and radiant three-colored jewel held aloft represents the ever-present reverence respectfully held by the Tibetan people towards the three supreme gems, the objects of refuge: Buddha, Dharma and Sangha. The two colored swirling jewel held between the two lions represents the people’s guarding and cherishing of the self discipline of correct ethical behavior, principally represented by the practices of the ten exalted virtues and the 16 humane modes of conduct. Lastly, the adornment with a yellow border symbolizes that the teachings of the Buddha, which are like pure, refined gold and unbounded in space and time, are flourishing and spreading.